Welcome back to part two of Emily and Jacob’s wedding in downtown Washington DC. This couple said “I do” at the iconic National Museum of Women in the Arts, where they held both their wedding ceremony and reception. In case you missed their beautiful and very personal wedding ceremony, be sure to check it out here. 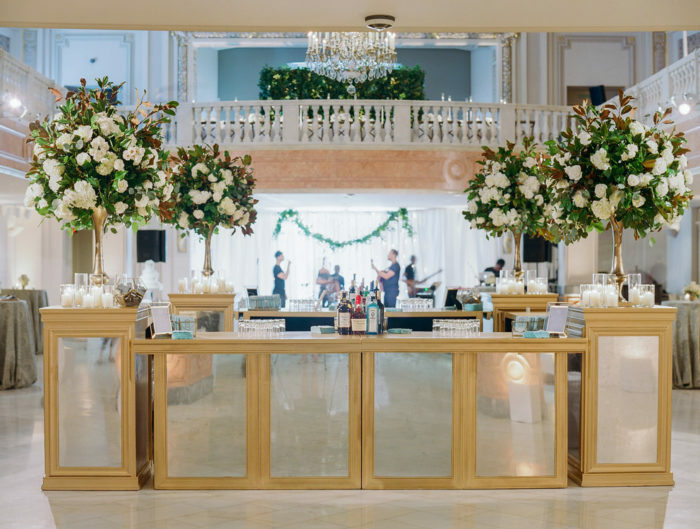 For their wedding reception, the group had a grand time in the museum’s vast hall, dripping with white orchids, stunning chandeliers, and personal touches. 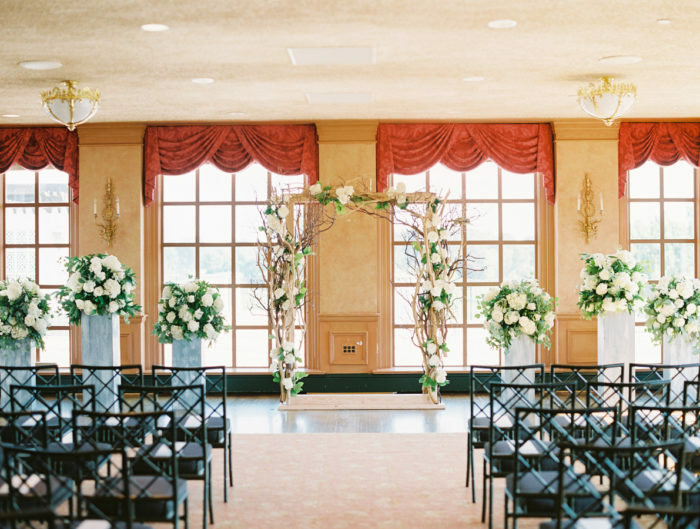 Emily and Jacob’s favorite wedding decor element was all of the beautiful artwork that surrounded them during the cocktail hour. The setting surrounded by their friends and family, and the art work paired with the personalized place cards that the bride’s mom made their wedding classic and elegant to a tee! 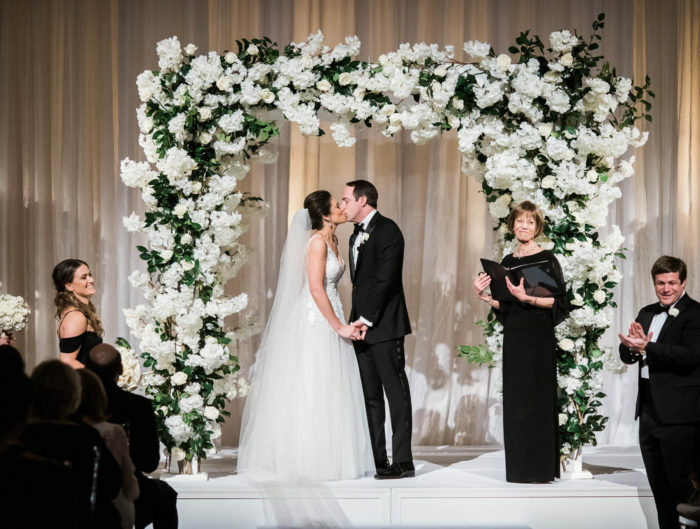 A big thanks to Jessica Schmitt Photography for sharing Emily and Jacob’s beautiful Washington DC wedding reception with us! From the bride: Our main wedding priority was spending the day surrounded by friends and family. That was something that Jake and I agreed on right off the bat. All of the important components were present on the actual wedding day, and I don’t have any regrets. I love the pictures that our photographer took, and I frequently look through them to remember specific moments. My mother spent weeks hand-making the name cards with calligraphy, watercolors and gilt powder. The presentation – when they were all laid out on the table – was beautiful. The National Museum of Women in the Arts was a Jake find and I fell in love with it the minute I saw it. My favorite part was the opportunity to have our cocktail hour surrounded by amazing paintings and photographs. Our wedding day was perfect. Despite two very different visions of what a perfect wedding day might look like, we both ended up really happy. Everyone said the day was a reflection of both of us. In the past, I thought it was cheesy to say one’s wedding was the best day of one’s life. But, after experiencing my own wedding, it really was one of the best days of my life. Realizing a vision that so many people worked towards, being surrounded by our friends and family, and celebrating my marriage to a totally awesome person was the best. Advice for other Washington DC area couples? In the Washington DC area you have a lot of choices when it comes to vendors. Don’t be afraid to speak up if you feel that you are not getting good service, or they are not realizing your vision to your satisfaction. More likely then not, they will pivot to accommodate you. The more specific that you can be about what you want, the more likely that they will be able to actually give you want you want. If not, there are plenty of other wedding vendors to try. If you aren’t getting what you want from one of your wedding vendors, don’t waste time stressing – shop elsewhere. This is cliche, but take the time to enjoy every step of the wedding planning process, because it is all special. It will all come together on your wedding day, one way or another. Congratulations to Emily and Jacob! Thank you for sharing your oh-so personal museum wedding reception with us!